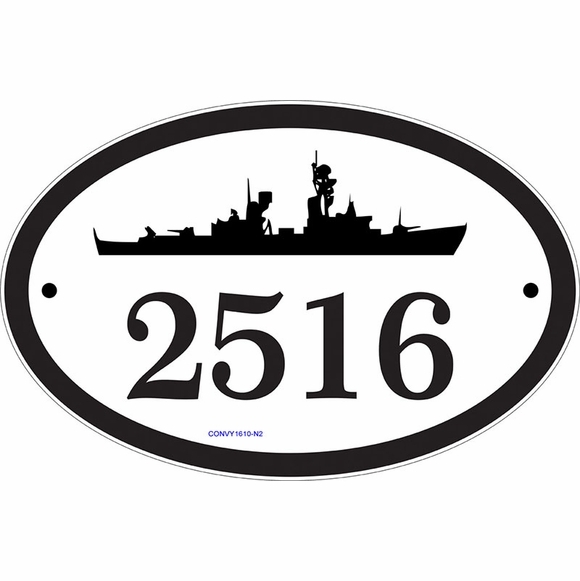 Personalized Naval Theme Address Sign - - Pay tribute to that family member or friend who serves our country with a navy themed custom-made address sign for your home or business. Personalized with one of seven types of Naval ship silhouettes, the street number or establishment name you specify, and the color you select. Made in the USA. 16" x 10.5" wall mount full arch shape sign. Perfect for a family that includes someone who is serving or has served on a United States Navy submarine, cruiser, cargo ship, aircraft carrier, destroyer, gunboat, or battleship. This sign holds either your street number on one line or your business or establishment name on two lines under the logo you select. The one-line address sign holds up to four (4) 3.5" or five (5) 3" numbers. The two-line establishment name sign holds up to ten (10) 1-5/8" letters on Line 1 and eight (8) 1-5/8" letters on Line 2. This version is designed for words, not address numbers. Character count includes spaces and punctuation. Note: the style number visible on the sample signs is for internal use only and is not on your custom sign. Ship silhouette, characters, and border are permanently engraved into the sign during the production process. Border is the same color as the personalization and accentuates the arch shape. Click links in Related Products to learn more about our military theme address signs and other items related to military service.